If ever there has been a time when talent development is critical to organizational success, this is it: with constant change, emerging technologies, new job roles, and imminent disruption, we depend on people to continuously develop their knowledge and skills to keep organizations nimble and thriving. Organization leaders must give attention to supporting the ongoing deep learning that allows people to contribute effectively. This week, the Association for Talent Development is publishing a set of handbooks by Elaine Biech that are a wide-ranging resource for those who lead talent development efforts. It’s a testament to the scope of our role that the project to document “foundations” takes a total of 1100+ pages across two books. I’ve had the opportunity to take a look at the galleys, and I think these are indeed a fine encyclopedia of our work, reflective of Elaine’s in-depth experience, key findings from important research in the field, and a cornucopia of highly-recommended practices for L&D. The TL;DR version of this review would be this: To be an effective talent development leader in the 21st century requires a broad swath of L&D skills combined with the qualities of a senior strategic leader. These books outline a robust array of foundations in these areas and leave tantalizing trails for where to learn more. These are worthy additions to your collection of handbooks and references. I was personally interested in reviewing the books because I have been exploring how the conceptualization and development of broad learning strategy is accomplished in our modern environment. I wholeheartedly endorse one of Elaine’s key messages: that in order to have impact, we must become trusted advisors in our organizations – much more than holding “a seat at the table,” we need to be valued collaborators in ensuring that our organizations have the human capabilities necessary to move forward. The foundation for talent development isn’t about negotiating a specific place on the organizational chart or advocating for new technology infrastructure (although these can be important). The foundation of talent development is developing a learning culture, promoting leaders’ responsibility for development, encouraging lifelong learning and a growth mindset, helping people hone their learn-to-learn skills and enabling not only individual, but also organizational and team learning (Foundations, p 12). In giving advice to talent development leaders, Elaine emphasizes robust alignment with organization strategy, which requires being savvy about business, digging into strategy details and initiatives, identifying the necessary future capabilities for employees and managers, and conceptualizing a comprehensive approach to L&D. In addition to being trusted advisors, Elaine challenges learning leaders to be learning champions, role models, and visionaries, and she speaks of purpose, connection, motivation, and engagement as central to a robust strategy. The books give direct advice on defining a business case, crafting a vision, and determining roles and services. All of this requires reimagining the scope of our efforts, and becoming versed in a wide range of emerging approaches and technologies that support learning and development (and ultimately capability, performance, and engagement). It’s a huge charge, and the advice Elaine gives for living out that charge is both concise and sweeping. And while the books have myriad action lists, what comes through most clearly is an emphatic call for L&D leaders to take responsibility for envisioning a comprehensive portfolio of talent development activities that directly support the organization’s strategic initiatives. From my perspective, the books set an inspiring tone and describe the kind of business-critical learning strategy to which we can aspire. There is plenty here to pique your interest and help you to address whatever part of your learning strategy needs attention. 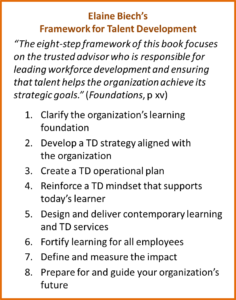 In ATD’s Foundations of Talent Development and ATD’s Action Guide to Talent Development, Elaine Biech lays out all that is required for decidedly impactful talent development in an organization – a responsibility that covers A LOT of ground. The books are structured around Elaine’s framework for talent development, honed over many years of practice in the field and interaction with senior leaders. (See sidebar.) The material draws liberally from recent research and deep practice advice from a variety of sources. In addition, over 90 leaders with diverse experience and expertise have contributed field stories, expert recommendations, and practical tools interwoven throughout the books. (A brief summary of my advice on scaffolding is included in the Action Guide.) These substantial sidebars provide real guidance, not just color commentary, as these leaders were generous in describing their specific initiatives and expert advice. 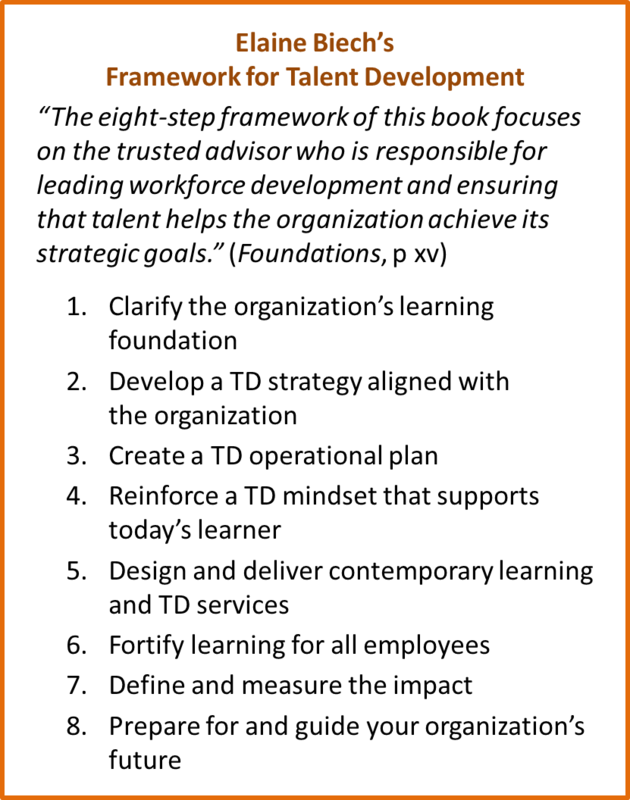 Foundations of TD is the more conceptual work, while the Action Guide is just that – resources for how to engage and implement recommendations for effective talent development. In these texts, Elaine concisely explains a lot of the key concepts which are too often seen as little more than buzzwords – e.g. mindset, interleaving, learning agility – and she deftly outlines their importance and role in a bigger picture. The appendices are a treasure trove of checklists, templates, and additional resources. Helpfully, both books are structured with the same chapter titles and can be read and consulted independently of one another. I have to say, though, they do make a nice set! For learning leaders who have not spent prior time in L&D, and those who have followed a career trajectory through specialty areas, the books help to expand perspective and invite deeper dives in areas that might be of strategic importance to their particular organizations. The books are eminently skimmable, allowing readers to drink in quite a bit of advice. At the same time, there is almost an overload of rich material packed into concise statements, so chapters are also meant to be savored, mulled over, and followed up with additional exploration. In addition to the books’ usefulness as a resource for professionals, academic course instructors may find the Foundations book to be a solid introduction to talent development, and their students will find it readable and persuasive. Faculty could supplement and enrich this material with work from scholarly journals that digs more deeply into key concepts. As excited as I am to see a set of handbooks this comprehensive, I have a few quibbles. As Elaine herself said to me when we chatted, each section could practically be a book in itself – so the work is necessarily kept at the summary and bulleted-list level. The books are full of well-considered imperatives – all of the things we should be doing. But there is not always ample detail on the “how,” and some readers may feel they don’t have quite enough to go on. The good news is that the advice is often cited from other sources, which can be accessed for more detail. Once you have the language and the core concepts, it’s easier to find more in-depth materials to inform what you are attempting to accomplish. The books are meant to be stand-alone works, but if you want both the foundations and the act-now details, it may be difficult to decide which will give you more of what you need. They each address the key concepts using the same framework, but if you are like me, my guess is that you are actually going to want to have both books on your shelf. The books are also pricey. That may discourage people who don’t have access to a generous book budget. It may also impact whether professors teaching in L&D programs adopt Foundations as one of their core texts in a general course on talent development strategy. In an effort to nudge L&D professionals closer to the business strategy of the organizations in which they work, many prominent people on our field minimize the importance of learning. It is refreshing instead to see texts on talent development that focus bright light on learning – and all that is required to support and promote it. This isn’t to say the books don’t also highlight how critical it is for us to be deeply tied to the goals and initiatives of our organizations – in fact, Elaine makes it a point to come back again and again to the notion that we should be trusted advisors – leaders who partner with colleagues to assess the human capability needs of the organization and devise a robust and impactful strategy to ensure the organization is ready and able to meet the opportunities and challenges it encounters. We are charged with leading the way for talent development in our organizations, and in ATD’s Foundations of Talent Development and Action Guide to Talent Development Elaine Biech gives us a road map on how to get there.